This stir-fried chicken dish uses Shanghai-style noodles. These are thick noodles that are packaged in plastic bags and sold fresh in Asian/Chinese markets. If you can’t find Shanghai noodles, feel free to replace them with Japanese udon noodles, or you can use thick Italian pasta such as linguini or tagliatelle. While this dish is usually served as a side dish, it is hearty enough to be a quick dinner in itself. You can adjust the seasonings to your taste. 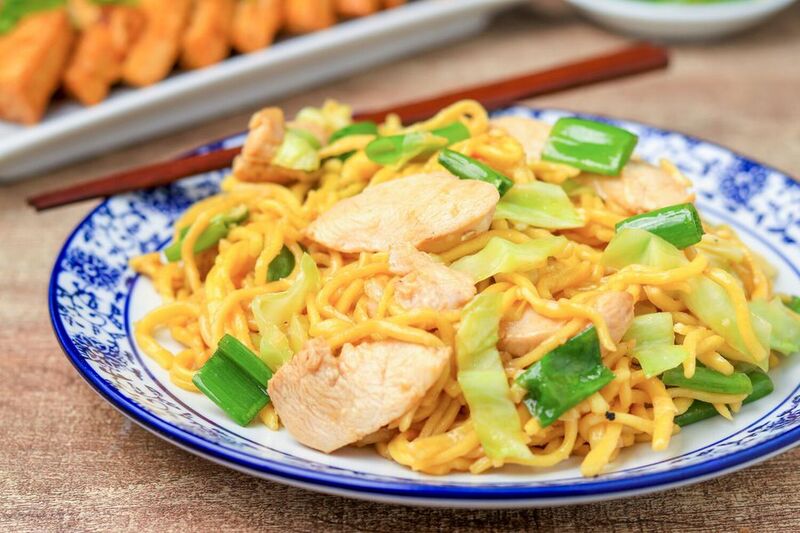 Note: while there are multiple steps to this recipe for Shanghai stir-fried noodles with chicken, it is broken down into workable sections to help you better plan for preparation and cooking. Cut the chicken into 1-inch or bite-size cubes (or you can cut the chicken into slices or strips). In a large bowl, mix together the dark soy sauce, rice wine, salt, pepper, and cornstarch. Add the chicken pieces, turning to coat them well, and allow to marinate for 20 minutes. While the chicken is marinating, you will prepare the remainder of the ingredients. In a large saucepan, cook the noodles in boiling water, stirring to separate, until the noodles are tender but still firm (al dente). Drain thoroughly. Rinse with cold water, drain again, toss with sesame oil, and set aside. Wash and finely shred the cabbage and set aside. Peel and mince the garlic. Cut the spring onion into 1-inch pieces and set aside; the onion will be used at the end of the preparation. In a wok or skillet, heat 2 1/2 tablespoons oil over medium-high to high heat. When the oil is hot, add the garlic. Stir-fry until aromatic (about 30 seconds). Add the chicken cubes. Stir-fry until they turn white and are nearly cooked through. Remove from the wok. Heat 2 tablespoons oil in the wok. When the oil is hot, add the cabbage. Stir-fry for 2 minutes. Season with a bit of soy sauce and/or sugar while stir-frying, if desired. Remove from the wok. Heat 1 1/2 tablespoons oil in the wok. When the oil is hot, add the noodles. Stir-fry quickly, stirring to coat the noodles in the oil and making sure they don’t stick to the pan. Add the hoisin sauce, again tossing to coat the noodles. Taste and add salt and/or soy sauce as desired. Add the cooked chicken and cabbage and mix well. Add the spring onion and stir well, to make sure all the ingredients are heated through. This recipe uses chicken as one of the main ingredients, but you can use pork or beef instead but marinate it in this mixture. Combine 1 tablespoon light soy sauce, 1/2 tablespoon dark soy sauce, 1 teaspoon sugar, 1/2 teaspoon cornstarch, and 1/2 tablespoon rice wine or Shaoxing rice wine. Add the pork or beef and marinate 15 to 30 minutes before cooking.